Can the screen be stopped at any point along the opening or must it fully retract like traditional roller screen systems? 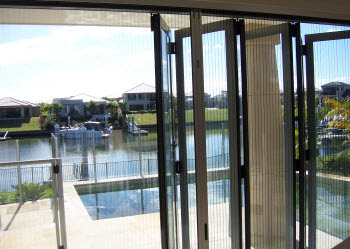 Due to the unique tensioning system, our screen can stop at any position. There are no braking systems or excessive force required to operate or stop our screens. Can I choose which direction the door can slide? Yes, but you must make this choice when placing the order. Does the screen meet the necessary fire prevention requirements for bush fire prone regions? No, this is a screen not a fire resistant mesh. If the kids or family pets damage the mesh can it be replaced? Yes, new mesh can be made to the exact size originally supplied. Is the replacement mesh easy to install? Not really, it is recommended that the mesh be fitted by us. Use a feather duster or soft dry sponge and wipe the mesh in a vertical direction. Cleaning can also be achieved using a light detergent and water mixture but can be messy. Is the screen totally insect proof? 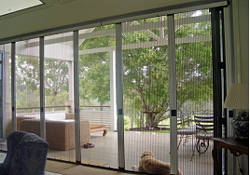 Our screens offer superior insect protection and have been specifically designed for use with windows, doors or large openings. No insect screen is totally insect- proof. What do I do if the mesh is subject to blowout/rumbling? Simply open and close the door fully 1-2 times and the mesh will realign itself back into position. Can my screen be adjusted in size? 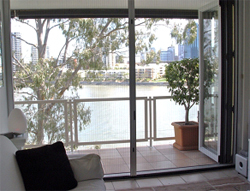 No, our screens are custom-manufactured to suit each installation. Can I install my screen? It is recommended that a professional tradesman installs the screen.